Despite being one of the most senior members of the current Indian cricket team, MS Dhoni even at 36 can give the young players a run for their money. The former Indian captain with strict fitness regime has maintained one of the healthiest and fittest mind and body. Some would argue that MS Dhoni as surpassed his prime and should call it off, but the resilient cricketer keeps striding forward convincingly answering the critiques with his bats. Recently during the 2nd t20 encounter between India and New Zealand Dhoni showed that he is the fittest of all when he did an amazingly flexible split in the 17th over while facing Mitchell Santner to save himself from getting stumped. It was in the 17th over that Santner caught Dhoni with a slower one as the Indian batsman stepped forward to play him and missed it completely. The ball went straight into the hands of Glen Philips and he put forth amazing glove work to strike the bails quickly, but Dhoni had sensed the danger and he made an unusually long stretch to make sure a part of his foot remained inside the crease and he is safe. The famous stretch went viral on social media shortly after it was successfully pulled off by the ever calm and cool MS Dhoni. People lauded him for maintaining supreme fitness despite the age. Some also said it is not easy to stump the man who has for 20 years of his life stumped batsmen. “He is the principal of the school where Wicketkeepers are trained,” said one user. “Never Easy to Stump the King of Stumpings, MS Dhoni.,” said another. Now that iconic split has taken over the internet and users have found out the funny side to it with several memes based on it. 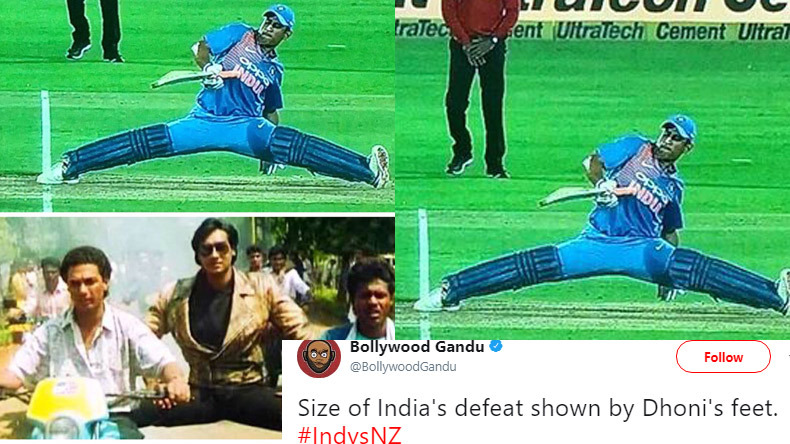 India lost the game by a significant 40 runs, and a Twitter user wrote “Size of India’s defeat, shown by Dhoni’s feet,” with Dhoni’s stretch picture. Many criticized Dhoni for not pushing the gear when it was required as India had to lose by a significant margin, but MS Dhoni still remains the most integral middle-order batsman for India. Be it contributing from behind the wickets with lighting fast stumping and crucial inputs for the bowlers and the fielders or stabilizing a deteriorating middle order.